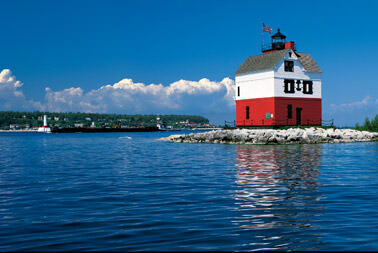 Available on any of the three ferry services serving Mackinac Island. 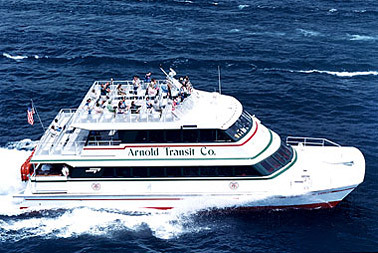 Your group can charter a ferryboat for a cruise of an hour or so. 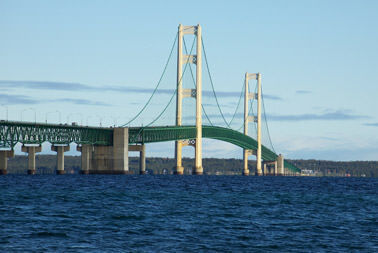 Your guide, author Mike Fornes, has written two books about the Mackinac Bridge and will present an outstanding talk about the Mackinac Bridge, Michigan’s crown jewel. At one time it was the longest suspension bridge in the world – find out where there are bigger bridges today and why the “Big Mac” may still be a greater engineering feat! Hear the dramatic tales of the brave iron workers who built this massive structure, how several of them lost their lives in the process, and what safety procedures today are in place to protect motorists, workmen, and boaters. How many cars have gone off this span? The bridge is the safest five miles of Interstate 75, yet you will hear the stories of how it has been struck by a ship, an airplane, and how an Air Force bomber once flew under the bridge’s center span. Mike will provide more than hearsay – in many cases these are eyewitness accounts of local history! 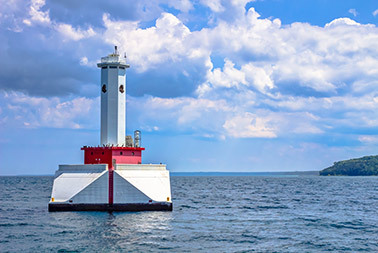 The Straits of Mackinac has documented evidence of about 200 shipwrecks beneath its icy waves, and local divers have discovered 49 of them. Your guide has actually visited many of these wrecks, and will tell the stories of these ships’ demise in shrieking winds, foggy calms, and frozen darkness. Hear the mysteries of the wondrous sights of schooners unseen but by a select few since the day they slipped below the waves, and the hidden dangers still below. Shipping today in the Straits still forms a busy highway to world ports of commerce. 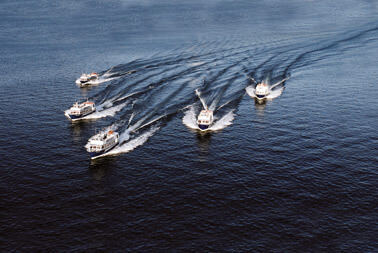 Your guide often contacts the captains of these vessels by radio, and your group can listen and hear facts about their cargo, ports of call, and the crews that work aboard. We often “chase” ships for an up-close view, and many times capture a breathtaking sunset that will be everyone’s favorite photo memory. 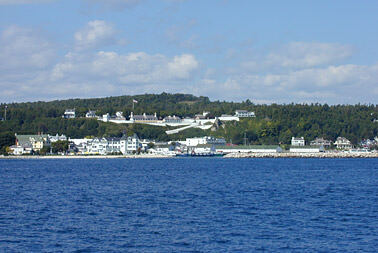 Mackinac Island can been seen on this journey, with the Grand Hotel, elegant West Bluff Victorian cottages, Devils Kitchen, and Fort Mackinac all visible with informative narrative provided. A typical Straits cruise provides views of four of the area’s lighthouses, with two more visible in the distance. Some of their lights still burn brightly today, reminiscent of an age without radio electronics, navigation equipment, or satellite mapping technology. Their stories are told as you see first-hand the images once hailed by the lookouts of sailing ships!